Things get old--and new again!--so quickly in these times of advanced printing and internet technologies. Back in early 2006, I wrote a series of poems where I basically copied the text of responses to mail order bride/sweetheart notices and just reconfigured them into couplets (a sample is available HERE; the series is available HERE). At one point, I submitted the series to a potential publisher; however, the publisher replied that while they found them interesting they wished I'd done more with the raw material (e.g., tinkered with the text). Basically, the work is a document that the poet received as a .pdf. After printing it out, Bloomberg-Rissman then slapped a cover 'round it and ... a poem was born! The document was a text that was modifying regulations on how the death penalty is to be administered in the state of California. Because this was an editing document, it contained various editing formats, like the underline indicating added text and the strike-through indicating deleted text. Based on just the first page, the editing changes offer much of what's poetic about the document, I mean, poem. For example, at one point, "person" was deleted and replaced with "inmate". A possible interpretation could be how "inmate" allows for a distancing effect from the "person" soon to be killed. When the word "warden" also was edited to reflect the capitalization of the first letter into "Warden," it gives additional weight to the role of said Warden. Inmates sentenced to death shall have the opportunity to choose to have the punishment imposed by lethal gas or lethal injection. I get the concept and I appreciate it (after all, I've done it!). But the thing with concepts is that one can appreciate it, as I do in the case of 2ND NOTICE..., without needing to immerse one's self in actually reading every word of the manifested poetry project. In the case of 2nd NOTICE..., I wrote the first draft of this review without bothering to read the rest of the poem after the first page. There's a concept to this project and my "review" relies on the concept. Do I shortshrift 2ND NOTICE... by not reading the whole thing before writing up 95% of the review? You can judge me by writing a review of it; a review copy is available through Galatea Resurrects! Anyway, there's a concept to this project and my "review" relies on the concept. I actually admire said concept--my take on it, as I've blathered numerous times elsewhere, is that Poetry exists all around us, and the role of poets can be just one of recognizing what already exists vs. a more interventionist authorial act. "YEAH, MM-HMM, IT'S TRUE / BIG BIRDS MAKE / BIG DOO! I GOT FIRE INSIDE / MY 'HUPPA'-CHIMP (TUM) / GONNA BE AGGRESSIVE, GREASY AW YEAH GOD / WANNA DOOT! DOOT! / PFFFFFFFFFFFFFFF! HEY!" "TO THOSE WHO SAY, 'THIS ISN'T WRITING, IT'S TYPING', i SAY, 'NO, NO, NO, THIS ISN'T TYPING, IT'S JUST DIGIMECHANICAL REPRODUCTION; ITS NOT EVEN CUT N PASTE'." If the inmate continues to refuse to comply with orders, an emergency cell extraction will be authorized. Like a poem, what's described here is a different world, and it is ours, even that of ye proverbial nuclear family sitting all cozy in their warm living room. (1) Two identical trays shall be prepared. (A) Tray A shall be color-coded red and will be the primary tray used for the lethal injection process. (B) Tray B shall be colored-coded (sic) blue and will be the backup tray. 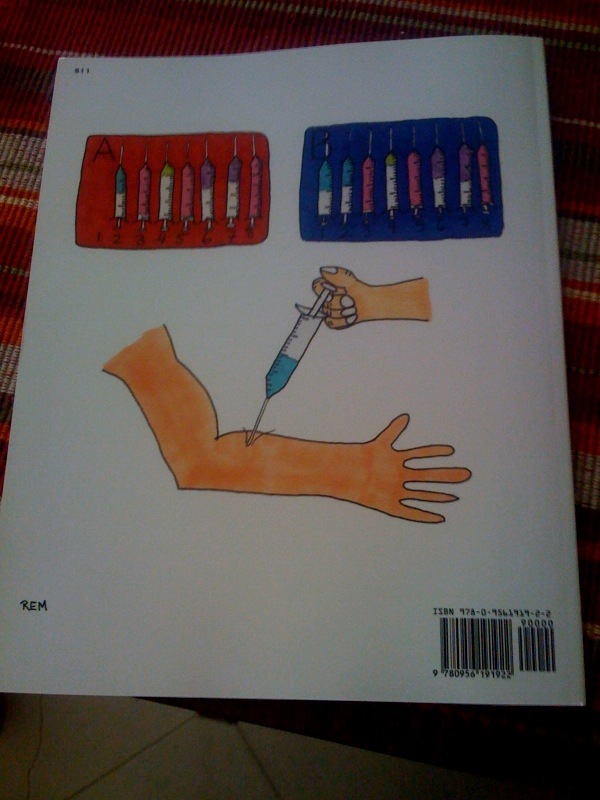 Though May is visually representing the A and B trays of lethal injection ingredients, I also appreciate how the trays, by being labeled with the letters "A" and "B", can imply that what's being injected is text into the author's (writing) arm. It's aa result certainly befitting the project's underlying concept. It's a nice drawing (done with markers) by May that, for me, elevates the project beyond being another "found poetry" work -- I'm happy to see the presence of her hand (pun intended), versus, say, a xeroxed image or collage of xeroxed images. And it's a paradoxical ending by reminding the viewer/reader that conceptualism is just one way. For the one conceptual failure in art-making is the insistence that its way is the only path.